March 12, 2012 by Alphageek in "alphageek", "cooking", "discovery"
The last post was about the hot sauce in my pantry. I quoted an eagle eyed reader who said something about how much hot sauce was in my pantry. I went on to say that I don't have that much hot sauce in my pantry. I provided photographic evidence and defended myself as only a geek can do. Sometimes, geeks pick wording carefully and this would be one of those times. Today, we are going to visit the hot sauce shelf in the refrigerator. Yes, there is an entire shelf in the alphageek's Headquarters that contains spicy delights to add to other dishes to bring out the flavors. Just so you can see, her is a shot to show exactly what is in the hot sauce shelf. As you can see, there is a wide variety of sauces and other hot items to bring out the flavor of your favorite dish. As I stared at this picture, a sense of deep thought came over me. A very strange thought for someone that has had a shelf of hot sauce for years. "Do I really need all of these hot sauces?" Sure, they are all good. We tossed the bad ones out a long time ago. Thanks to the preservative nature of heat, these jars can be enjoyed for a long period of time. But I began to wonder why I have some many different ones. Actually, I began to analyze what purpose each one serves. I hope this information will help me understand why some seem to last for years, while some are used up almost instantly. As I look over the shelf, I realize it is interesting which ones don't get used as often. These lower use ones come in two basic categories. The first are some sort of curry paste. Curry pastes are strange, because they really are delicious, for something that comes in a jar. Curries need lots of oil to cook correctly, and release their flavor. Since I don't cook lots of oily food, they don't get used very often. Even if I did use the oil, they are just too darn hot, if used correctly. If adjusted for the heat, the excellent flavor they impart is simply lost. Perhaps I need to find some better medium curries? The second category are the sauces made from scotch bonnet peppers. While scotch bonnet peppers are some of the hottest around, it is not the heat that keeps these on the shelves. I find they have a somewhat strange, almost fruity taste to them. As a result, many of these are used in fruity, carribiean type dishes. I am just not the biggest fan of heat and fruit together. While I use these sometimes, I just find the opportunities are more limited. Why did I write that long lead in, to tell you that I am going to tell you about my favorite three hot sauces? Because my analysis revealed that the reasons are going to be brief, and to the point. No need for further analysis, these sauces have stood the end of time. Traditional cayenne pepper sauce, preferably Crystal Hot Sauce. Right now, we have Franks Hot Sauce. This is great on anything remotely southern, or traditionally American. I guess I am just used to it because it always tastes "right", like reading a recap of Maxwell's Equations. Something chipotle. Chipotle are smoked jalapeno peppers. The smokiness compliments almost any Tex-Mex, or true Mexican flavor, or anything that you have pulled out of your smoker. Sriracha Sauce. Only here will I accept no substitute. This is simply a unique flavor. While the web site says that this was developed in the United States, I find it compliments almost any Asian dish I have ever had. This is backed up by finding this sauce at almost any restaurant that serves Asian food. I think of it a hot sauce version of ketchup because it is universally served. 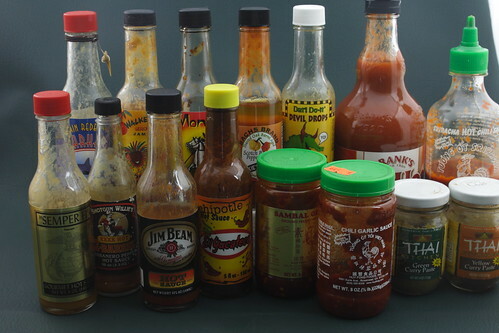 So, go back and read the previous article, (you will have to click on the underlined text) or at least look at the pictures, and see if you think I have more or fewer hot sauces than those pictures from the grocery store. I think I have a ways to go, but I am willing to admit an entire shelf dedicated to hot sauce is a little extreme, but then again I am the alphageek. As always, please leave your opinions below. Go ahead, I dare you.